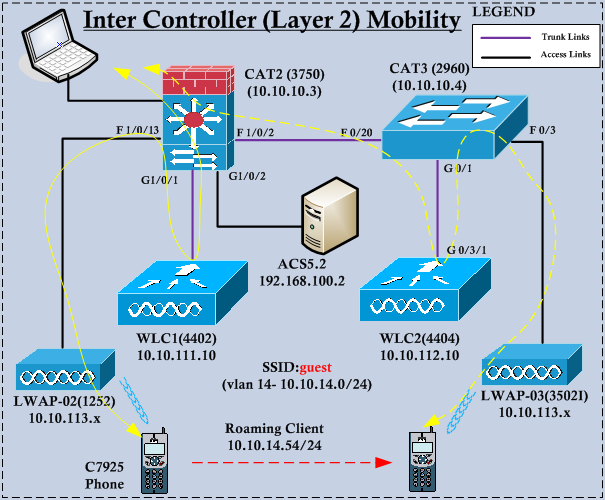 Since this is LAB environment, I will disconnect client forcefully from previously associated AP in order to client to go to other AP . This is how I simulate client roaming. I will have active voice call while this roaming event occur & observe whether that call session get dropped while roaming occur. First we will check the client associations in WLC1. Now we will forcefully remove this client from WLC1. See the below screen how to do this. I did not noticed call get drop during this roaming event. You can see client entry moved to WLC2 which is normal in L2 Roaming. In next post we will see how L3 roaming occur.